Is there anything better than the smell of warm banana bread baking in the oven? Of course there is! Eating warm banana bread straight from the oven, that’s what’s better! While baking is definitely something I like to do, I don’t always have the time. Sometimes, I want banana bread and I want it NOW. Well, I am happy to say that I have the answer to this necessity and it is delicious. I feel like sweet breads always have some sort of memory attached to them. For me, it’s really zucchini bread but banana bread is right up there with it. The smell of the bread baking brings back memories of my grandma. It also reminds me of the times I used to help my mom make it and then later making it on my own. I had the recipe memorized. The farmer up the street would bring us enormous zucchinis from his garden and we would get to making loaf after loaf of bread. Sitting at the dinner table and enjoying a piece with fresh butter was perfection. Yep, food can definitely spark the light of old times. So if you are up for a trip down memory lane, these bites may certainly do the trick. 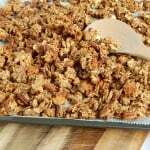 In a food processor, combine walnuts, pecans and oats until a fine, grainy texture. Add dates, banana, vanilla, salt, and cinnamon and combine until a dough starts to form. Refrigerate for about 20-30 minutes to set. If dough seems a bit sticky when rolling into balls, put in the refrigerator for about 15-20 minutes or so to chill. You can also throw in another 1/4 cup or so of oats to help absorb. Those look soooo good! I only wish I could eat them. I have diverticulitis and can’t eat nuts or seeds. Do you have any suggestions as to what I could substitute? Thank you for all of your wonderful recipes. Ok, here is what I am thinking. I bet if we upped the amount of dates and oats we could do without the nuts. Let me play around and see if I have any luck! Wow, I didn’t think of that. How do you have time for anything other than your beautiful baby? You must be Wonder Woman in disguise! Ha!!! Well I have to be verrrry intentional with nap time! Plus my husband gives me a little time on the weekends to get blog stuff done! These sound divine. And the photos are just gorgeous. Thank you so much, Nicolette! That means so much! Zucchini bread was another huge fave of mine to bake as well!! 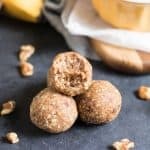 I love love love these no bake bites! I’m a huge fan of them for a grab-and-go breakfast option. My kids love them too! Yep, if the kids are up for them always a win! Gotta add the sea salt, right?! I love ANYTHING no bake. Especially with a newborn right now. Yep, that’s what I lived on when Sam was born! What a perfect healthy snack for the upcoming pool and hiking season! Love all things banana bread! These sound delicious! I love banana bread, but I’m on a hunt for healthier options. I’ve also just recently started cooking with dates. Excited to try these! Enjoy! Dates are a game changer! Snacks like this is what gets me though the day! I cannot wait to try yours out! Yep. Easy to grab eats are where it’s at for you now I’m sure! Always a win in my book! Omg, these look like such a yummy snack. Can’t wait to try them! 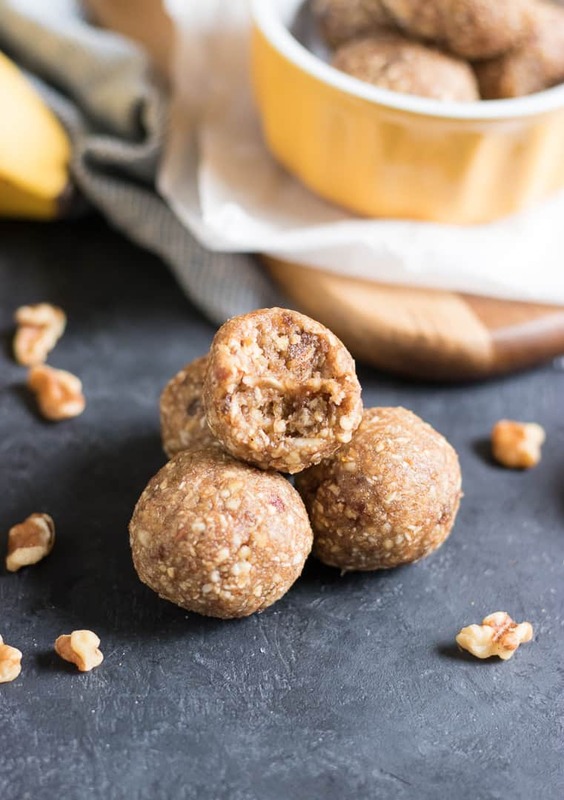 No bake bites are the best! These sound super yummy! Always the best, thanks Sonali! 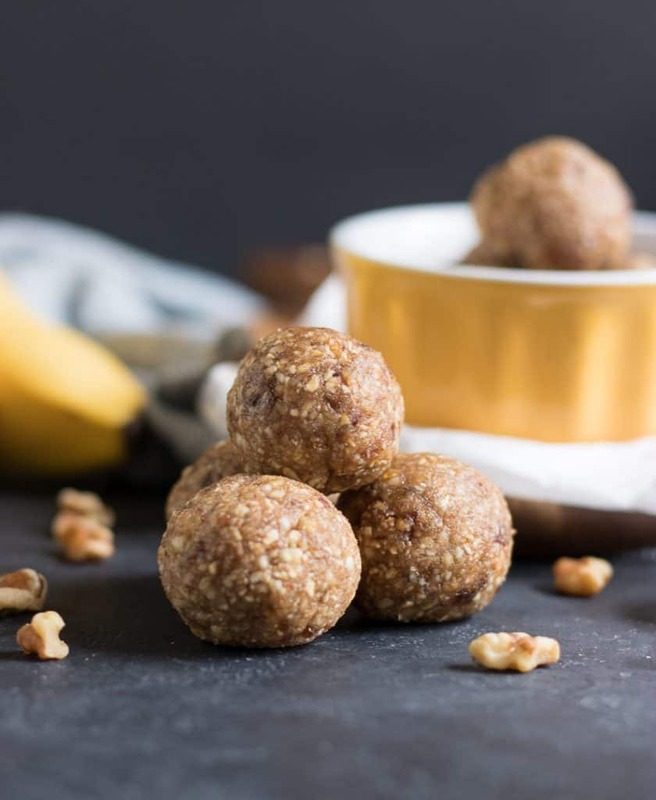 I love that these are sweetened with dates and bananas! What a delicious treat! These have always been one of my faves. It was one of the first times I had used dates. Game changer! Banana bread is always a great idea and these would be perfect to have stashed in the freezer for when I crave banana bread and don’t have spotty bananas or the time to make it. Yes, great for the freezer for sure! These look amazing! I’m gonna have to try them soon! 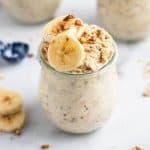 My husband and I love energy bites like these. Really loving the yummy banana bread flavor you have here! Aren’t they just the best to have around? ?